Porcelain veneers are one of today’s most popular cosmetic dentistry treatments. Crafted from translucent dental-grade ceramic, veneers from Independence Family Dentistry in Erlanger cover stains, crowding, gaps and cracks beautifully. With good aftercare, porcelain veneers placed by Dr. Danny Nakhla last for years. Porcelain veneers are a frequent part of cosmetic dentistry makeovers. Crafted from tooth-colored ceramic to improve the appearance of healthy teeth marred by aesthetic problems such as chips and deep stains, veneers enhance smiles and strengthen tooth enamel, too. Often, they are used along with professional teeth whitening, porcelain crowns and composite resin bonding for a completely new smile zone that the patient can be proud of. Dr. Nakhla examines a patient’s teeth to see if they are healthy enough to receive veneers. Basically, teeth should be free of decay, gum disease and extensive restorations. Additionally, the patient should be able to give the dentist a realistic idea of how he or she would like their smiles to look. Digital X-rays and other imaging help the dentist determine the correct cosmetic treatment plan. If veneers are appropriate, the dentist removes a small slice of enamel (1/2mm) from the front side of the teeth. This process is painless and brief and allows the mouth to accommodate the veneers properly. Dr. Nakhla also takes oral impressions and sends them, along with a treatment plan, to an outside dental lab. At the lab, a master ceramist constructs a three-dimensional model of the patient’s mouth and fabricates the veneers right on the model. After a week or so, the patient returns to Independence Family Dentistry in Erlanger. The dentist permanently bonds the porcelain veneers in place using a special adhesive and hardening light. He can adjust the color of the veneers by changing the shade of the bonding cement. After some minor bite adjustments, the aesthetic procedure is complete. The patient adjusts quickly to the feel and bite of the new veneers. Aftercare is simple: routine twice a day brushing with a non-abrasive toothpaste, daily flossing and twice yearly check-ups and cleanings with Dr. Nakhla keep veneers shining and intact. 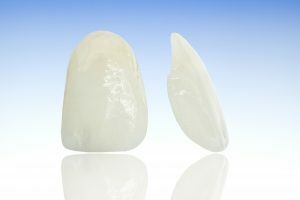 In general, porcelain veneers have a lifespan of about ten years, but the American Academy of Cosmetic Dentistry says they can last up to 20 years. In fact, more than 90 percent of these outstanding cosmetic improvements stay in place and look great for about 13 years. Also, expertise in placement and how much veneer projects over tooth edges affects their longevity. Fortunately, Dr. Nakhla and his team are very experienced in cosmetic dental services and have the skills for successful placement and evaluation of who is a good candidate for veneers. Find out if porcelain veneers are right for you. Contact Independence Family Dentistry for a cosmetic dentistry consultation. You will learn all about porcelain veneers and catch a vision of how your smile can change.